Visit Seattle and you can go for the same type of experience that you can have in most cities. Public buildings, restaurants, shopping, museums, and all the usual places listed in the tourist guide. 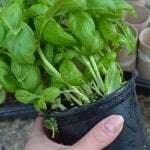 However, delve a little deeper and you can find far more unique things to do, especially if you’re looking for a more earth-friendly experience. 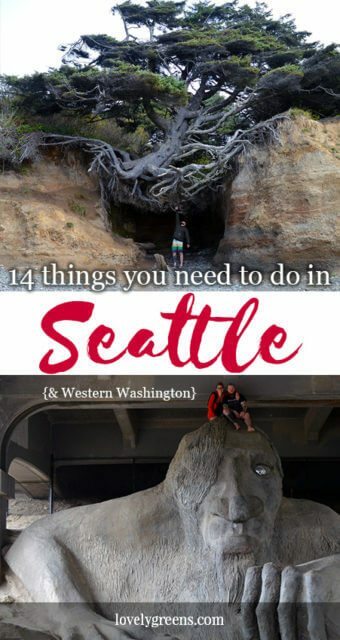 This is a guide to 14 unforgettable things to do while you’re visiting Seattle and the north-west of Washington State. All are low-impact and focus on exploring nature, art, food, culture, and gardening. 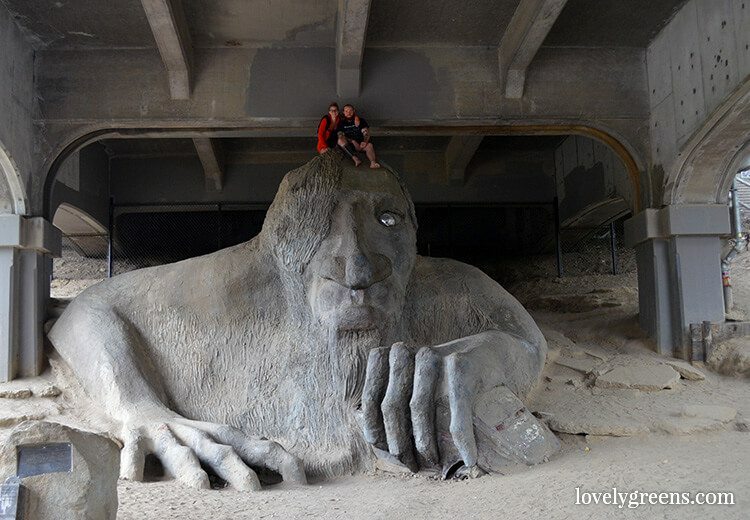 Sitting under the Aurora bridge in an artsy part of Seattle you’ll find a famous troll. It’s a massive concrete sculpture that’s located at the top of what else but Troll avenue in Fremont. Clutching an actual VW Beetle, the public art installation was built in 1990 after the idea won a local art competition. These days it’s fun to climb for a fun photo op! 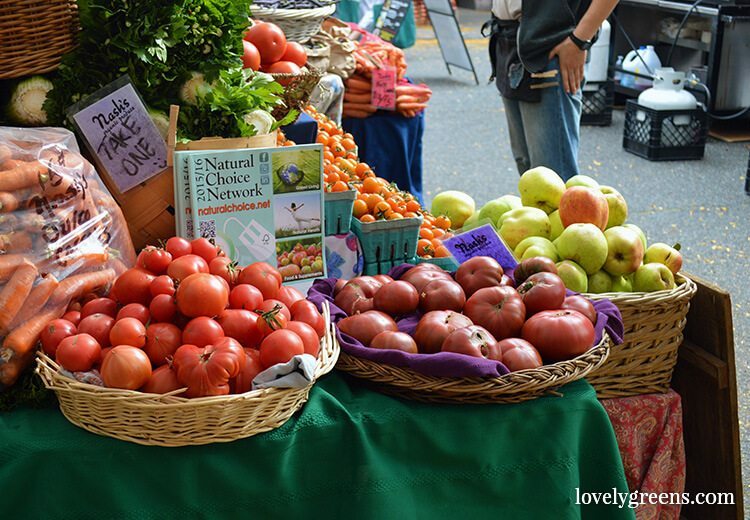 While the Pike Place Market attracts the tourist crowds, head to Ballard to shop at a real farmers market. Open every Sunday, rain or shine, it offers you stall after stall of the best of pacific northwest fare. 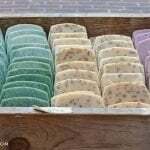 Organic berries, fruit, and vegetables from small farms, raw honey from local beekeepers, seafood, wild mushrooms, natural skincare and soaps, and some of the most beautiful (and inexpensive) cut flowers you’ll ever see. You can use ordinary cash to make purchases but the market also supports its own currency. If all you have is a credit or debit card you can purchase wooden tokens from the market info desk. Find the market on Ballard Avenue from 10am-3pm every Sunday. More on the Market along with plenty of photos. You’ll squeal with excitement at seeing Orcas jumping through the waters of the Puget Sound. I did! Take a tour from a local sightseeing company like Island Adventures and prepare to see these majestic creatures in the environment they were meant to live in. You’ll also be happy to know that no airplanes or sonar are used to scout the whales each day. They are spotted by eye and boats are required to keep a distance from the animals. That didn’t stop one whale from chasing a salmon out towards our boat though! 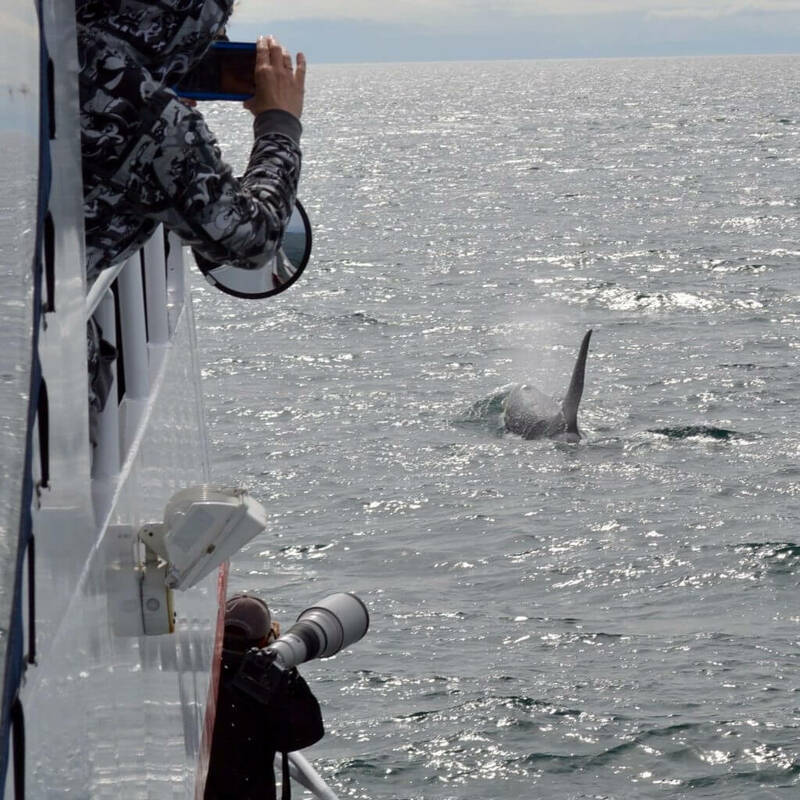 More on our whale watching experience. Washington is known as the Evergreen state now for two reasons! Cannabis was legalized for recreational use in 2012 and since then it has happily integrated with local culture. One moment you’re walking down fifth looking for the light rail station and the next you’re walking through a patch of MJ. It’s really become a cheeky part of the Seattle experience. The locals talk about the legalising of marijuana as the end of prohibition and most are pretty relaxed about it. 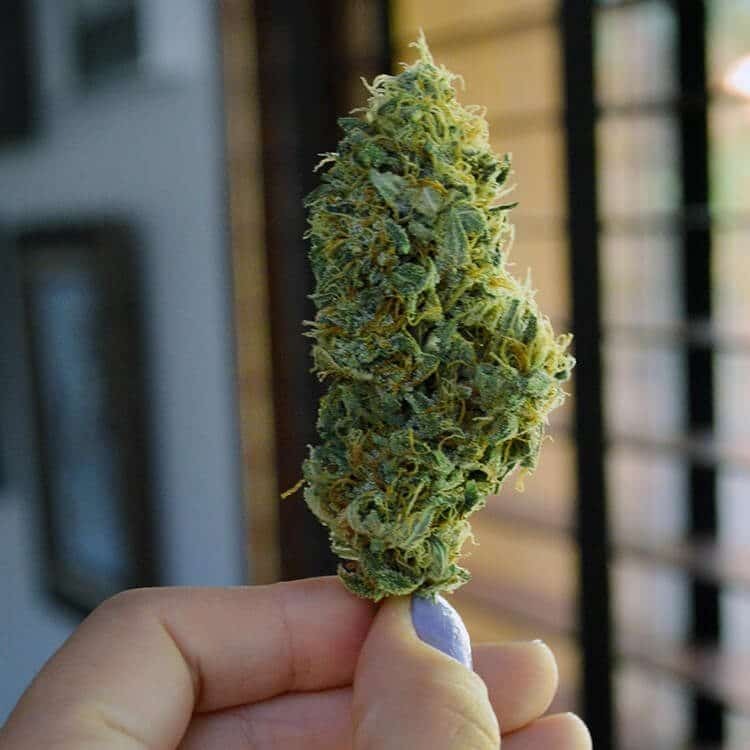 If you are 21+ years old you may possess small amounts and even stop by a pot shop to stock up on cannabis topicals, sprays, buds, joints, and edibles. It’s not legal to take them in public but some places, like the Green Tortoise Hostel, offer a ‘Smoke Room’. 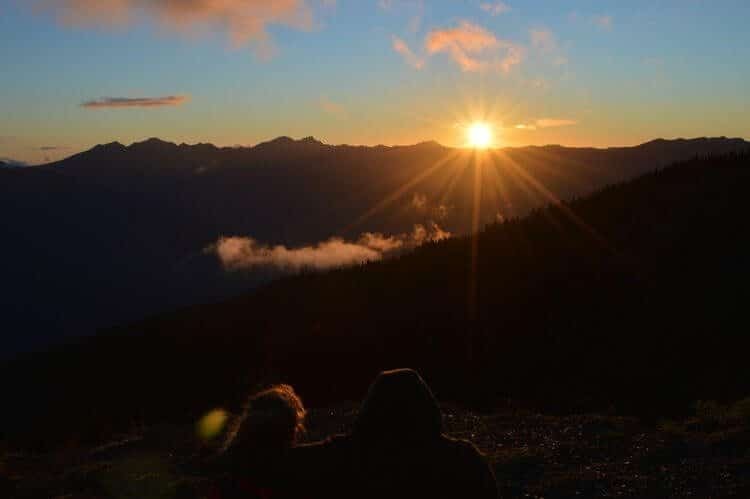 One of the most beautiful sunsets I’ve seen was at Hurricane Hill. The woman who kindly took us up the mountain said that the best time to visit is when the sky is relatively clear but when there are still clouds in the west that can light up with colour. She was right! What made the scene even more beautiful was the silhouette of mountains and the crisp autumn air. Read more about our own sunset. To get to this spot we drove for about half an hour from the nearest town, Port Angeles, and into the Olympic National Park. If the park’s booth is manned then you’ll need to stop and pay $10 per vehicle to enter. We drove past the main Hurricane Hill visitor center at the top of the mountain and a couple minutes further to the trailhead for Hurricane Hill. A 10 minute walk down the path and up a hill and you’re there. On a sandy beach washed with waves from the Pacific ocean you’ll find the Tree of Life. That’s the name given to a famously gnarled spruce tree that seems plucked from a fantasy movie. It started growing on the bank above the beach near Kalaloch and in an area where a small stream sometimes runs. The stream eroded the soil from under the tree, leaving its twisted roots suspended in the air over a small hollow. To get to the tree you’ll need to go access the beach through the Kalaloch Campground just north of the restaurant. Once on the beach start heading north and you’ll spot the tree after walking about 100 feet. The land that the entire downtown of Seattle is built on is man-made. Using water blasted from hoses, more soil was moved down the hill to build this area up than there was soil removed to build the Panama Canal! Tickets for the tour were $17 and it was well worth learning about the part of the city that still lies underground. Instead of moving the soil before buildings were made, the entire ground floors of existing structures were buried. This created a space for the seedier sides of Seattle business to move out of sight. What’s also fascinating is the way that the streets of the underground were lit. In my years of walking through Pioneer Square I’d barely noticed the glass elements sometimes showing in the pavement. 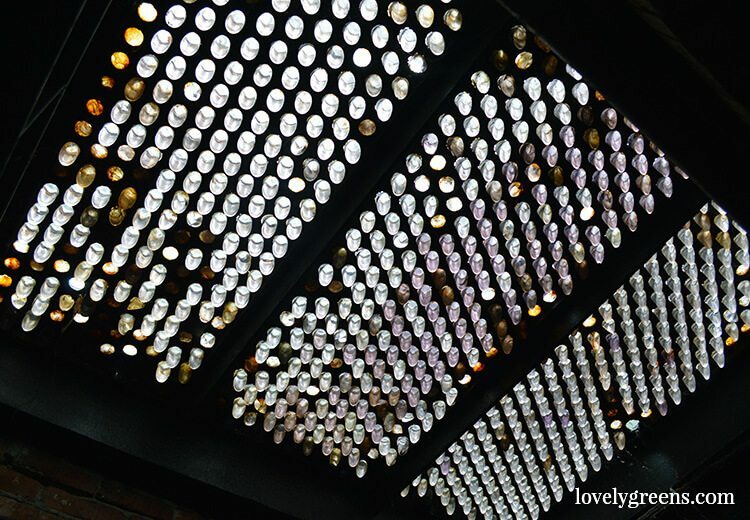 From below they are long glass pieces that gather light and illuminate the darkness naturally. Germany can’t touch the variety and complex flavours of the beer in the Pacific Northwest. In one grocery store alone there were close to a thousand to choose from! The double IPAs were very popular with my boyfriend, partially due to the hopsy taste but also to the 9% alcohol content. You can get a lot of the beers at large supermarkets but it’s well worth visiting the micro breweries they’re produced in too. 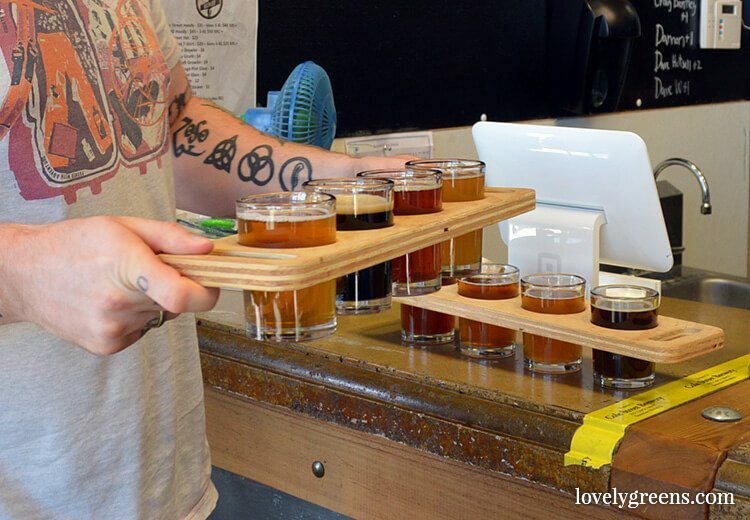 When visiting try a ‘Flight’, a set of half-pint servings of several types of the beer they have on tap. Visit the Pike Place Brewery on 1st avenue in Seattle and the Diamond Knot if you’re in Mukilteo. At the latter you’re served free peanuts and encouraged to throw the shells on the floor. A weirdly satisfying experience. Here’s a more extensive list of Seattle micro-breweries. 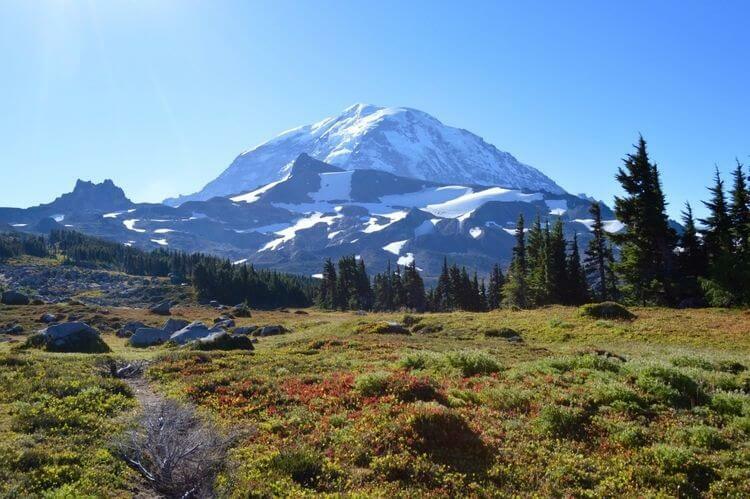 Overlooking the city like an Mayan temple, Mount Rainier sits on the skyline of Seattle when the weather is clear. This snow-capped volcano is a couple of hours drive south and the forests at its base have been protected as the Mount Rainier National Park. 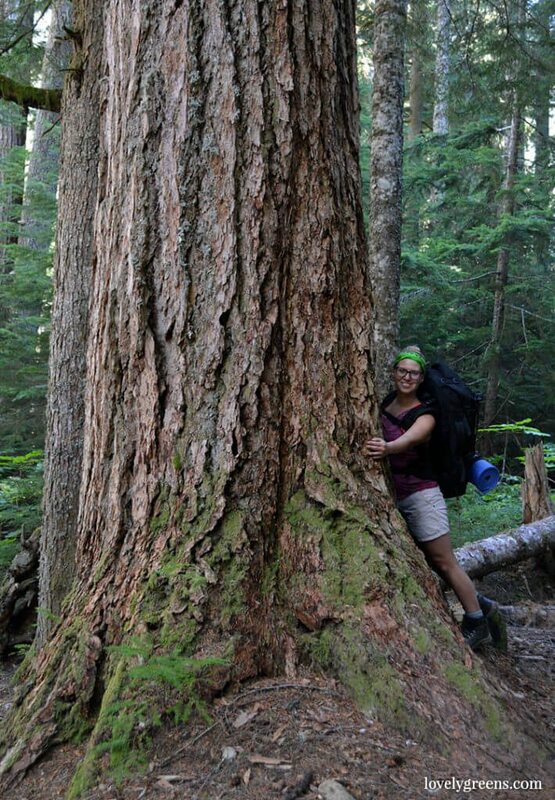 We spent four days backpacking through a part of the park and came across scores of big, beautiful trees. In wonder I tried wrapping my arms around them but in photos I ended up looking like a squirrel attempting to scurry up a tree! Sadly one giant fell across the trail and rangers had to remove part of it so that hikers could pass. I tried counting the tree rings to see how old it was but it was difficult. It was at least 400 years old. 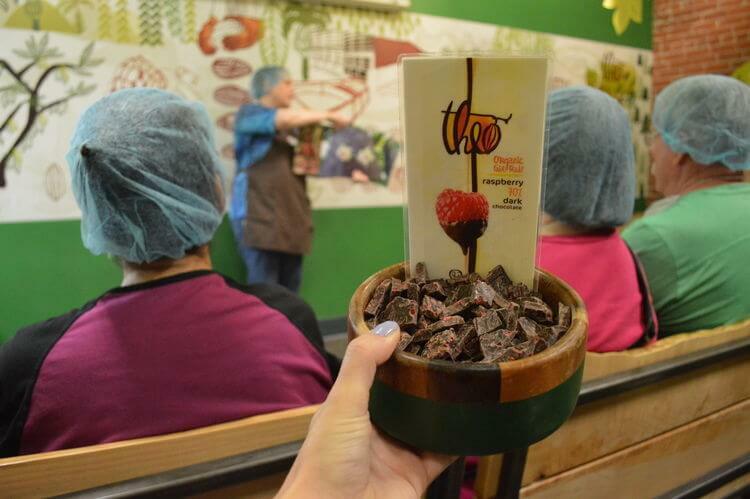 Theo Chocolate is not only delicious but produced with values that support quality food and the people who make it. They’ve limited their sources of organic chocolate beans to just two areas of the world since their experience found that ‘Fair Trade’ wasn’t always fair. 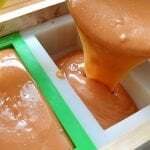 They now work with farmers to grow and prepare the beans in South America and Africa and in their factory in Fremont they roast the beans transform them into lush dark chocolate. From Kerry park on Queen Anne you have one of the best views of Seattle while surrounded by the beautiful homes on the hill. Go there by day and it will always have at least a small group of people admiring the view of the city. Head there at night and you might be lucky enough to have it for yourself. I first heard of this community garden through a viral Facebook video and made it my business to visit. 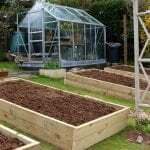 A definite must-see for those interested in Permaculture and urban gardening, the project is based on the idea of growing ‘Food for Free’. 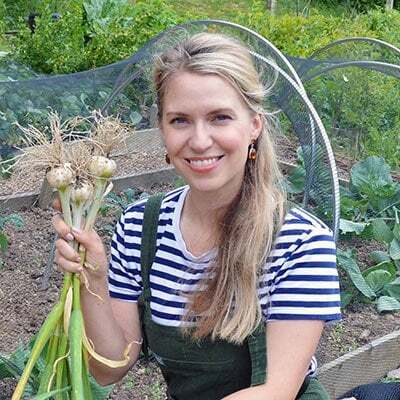 There’s an area for community gatherings, allotment-style garden patches, and part of the growing area set aside as a community ‘Food Forest’. This area is planted with perennial fruits and berries that are there for the taking. Anyone can help themselves to pickings in the Food Forest if they also lend a helping hand by weeding or donating to the project. 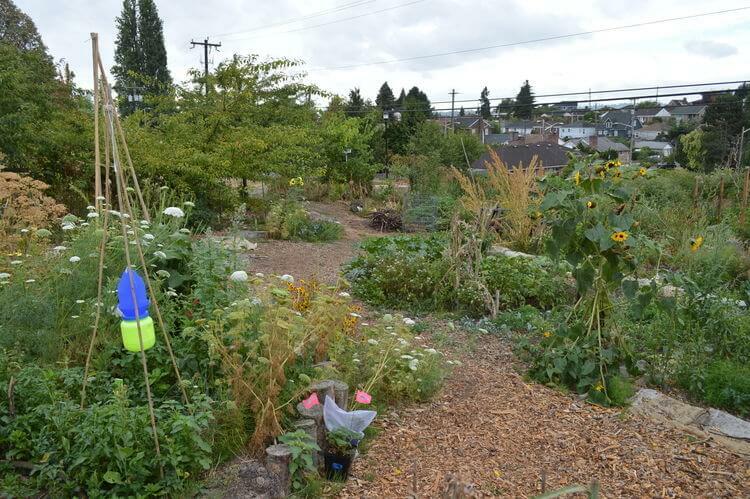 The Beacon Hill Community Food Forest sits on the back side of Jefferson Park in Seattle. We were able to walk there in about 15 minutes from the light rail station for Beacon Hill. 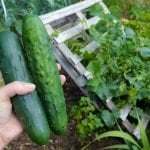 More about the food forest here. 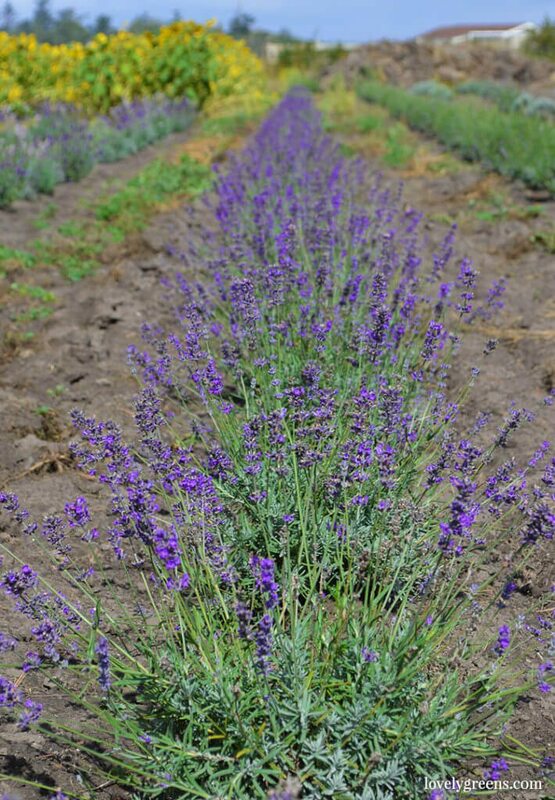 Lavender Wind Farm is located on Whidbey Island and the folks who run the farm use the lavender they grow in their own products. 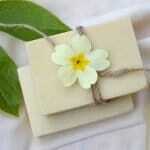 These include essential oil, skincare, and soap, which are for sale on their website and their shop in Coupeville. Visiting the farm is free though and you can walk through acres and acres of fragrant lavender throughout the summer. We visited on the last day of the season and strolled through on our own looking at the rows of lavender, beehives, and the sunflower spiral. More on the farm. Seattle buses generally cost $2.50 and can take you anywhere in the city. 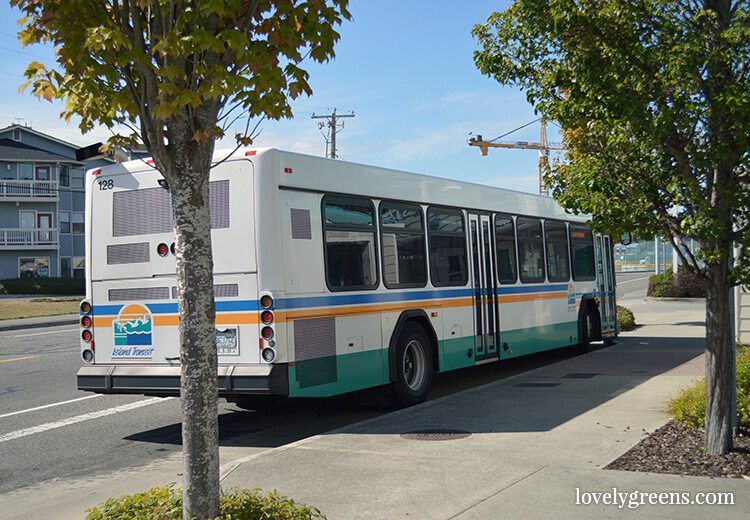 The Dungeness line bus (free wifi on-board) can take you round-trip to Port Angeles from Seattle for about $50. That includes ferry fare as well. 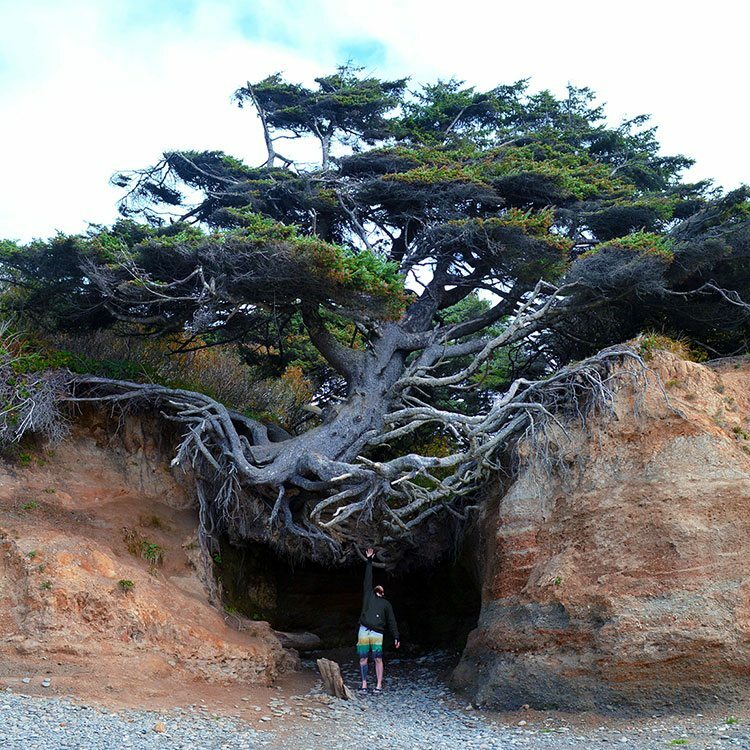 If you’re interested in getting to the Tree of Life at Kalaloch you can get there from Port Angeles (via Forks) on the bus for just $2. That’s an 80 mile bus ride for $2. I’m still in shock. Please be aware that on the Jefferson country line of the route the bus driver has discretion on what music is played. Our driver was a fan of Madonna, Lady Gaga, and an amusing mixture of other pop artists. All the buses on Whidbey Island are FREE. I live way from Seattle Washington, we were gifted with tickets to the seattle seahawks game on 9/25/16 and went..the parking was only good because we talked with a top person from the METRO bus company and he allowed us to park free in the bus area which was fenced, patrolled and secure, he parked there too..We got there early, not great at all the people were begging for food and drugs, the parking at a WAMU place $50.00 oh, my goodness sakes alive! We got in early to find our seats, nosebleed and high as could be oky doky with us..then the game was nearing, druken, people who stood up and threw debris and cursed the whole game..We left and saw it when a attendant could see we could not see and were visibly upset, we stood the whole game, our only child paid plenty for those seats and they were horrible..The people drank so much beer and cursed and threw debris for the entire game, older people and younger people..We will never return, wasted 4 hours of our lives we could have been exploring Seattle areas and beyond that are lovely..Seattle has become a huge huge city of have nots and rude, crude rich people. The bus system you tout is good only if you are aware of the routes, times and the fares..We live a long ways from Seattle are happy about that..We were disgusted driving home to our little place in a littler town, NO THANK YOU AT ALL! Hello! It doesn’t sound like you had a great time at the Seahawks game at all. Don’t give up on an entire city though yet. 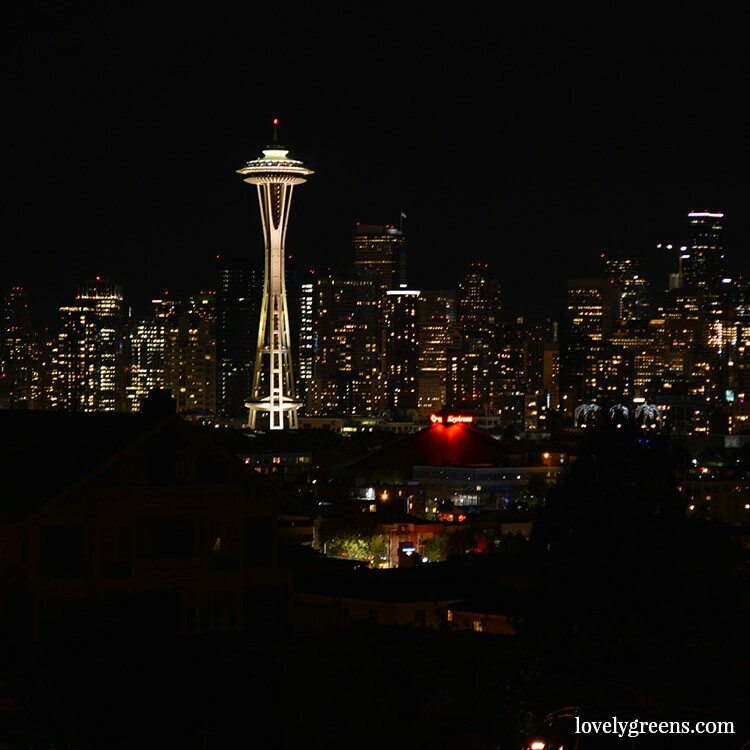 There’s a lot more to Seattle than a single sports game and the folks that you encountered there.